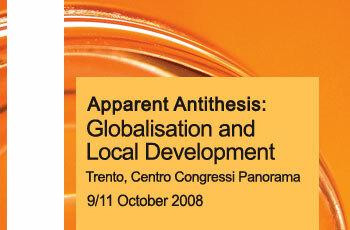 The international conference intends to deal with the apparently antithetic relationship existing between globalisation and local development from an interdisciplinary and comparative perspective. The world is currently experiencing a prolonged period of openness and integration, popularly labelled as “globalisation”. The standard approach explains that increasing openness, interaction, and integration of societies, economies and technologies lead inevitably to convergence of practices, standards, and structures. Particular features and distinctiveness either disappear or have to adapt and integrate into the global flow. In an alternative scenario, based on distinctive socio-economic systems (“national capitalisms”), convergence is not a necessary – and not even a likely - outcome of globalisation. Under these conditions it is impossible, inconvenient or irrational to converge to a unique model that would waste precious idiosyncrasies, impose higher costs to most of the countries and actors, or dangerously increase the risk of uniformity as against the advantage of differentiation seen as a sort of insurance mechanism against the unpredictable and the unstable. Where does local development lie in these dominant paradigms? The relevant literature is not explicit on the issue in that it concentrates on either local development per se in fundamental isolation from broader processes, or it sees local issues as mainly the necessary declination in the territory of global processes.